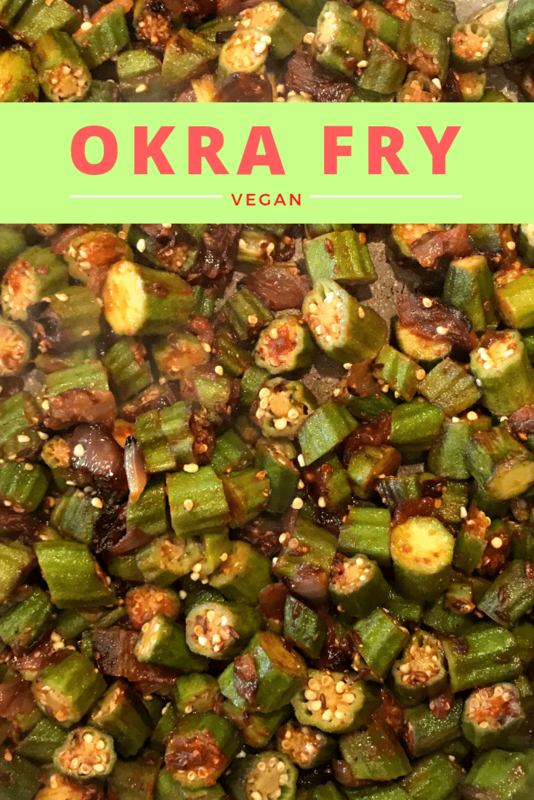 If you are passing on a superfood like Okra because you hate how it tastes or because you do not know the right way to cook them, try this quick and simple recipe for Okra Fry and add Okra to your shopping list every week! Okra Fry is downright delicious, sumptuous and healthy stir fry with few simple ingredients. It is typically served with steamy hot rice or Indian roti, but it pairs very well with just about anything that is bland. 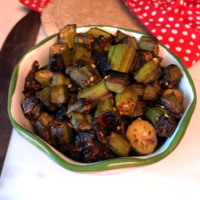 Since I have been successful in getting my kids to eat (and crave) for Okra Fry, I think you will love this too! Have you noticed that Okra hardens as it ages? As they mature on your shelf or at the market, it becomes difficult to cook them. The trick to picking fresh and tender Okra is to see how easily the tail snaps off when you bend them. If it bends but does not snap, it is not the one you need. 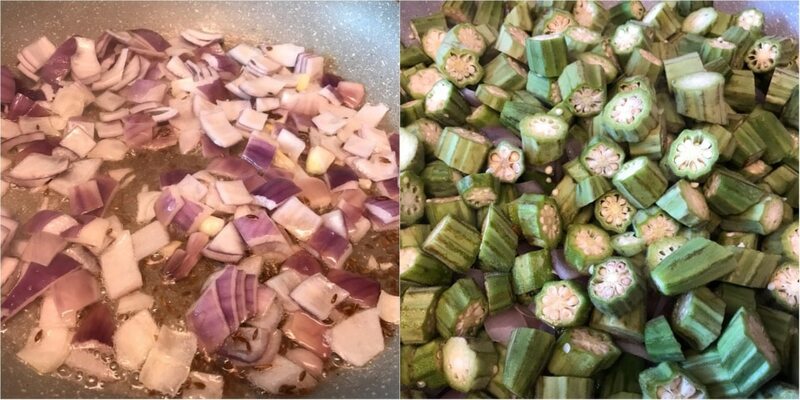 Cook them within 2-3 days after you buy and you will get the wholesome goodness from Okra! If you are turned off by how slimy Okra can get, try this trick for better results. After you wash and pat dry Okra, cut the tails and heads off and spread them on a cotton towel. Cut them as you prefer for your dish. 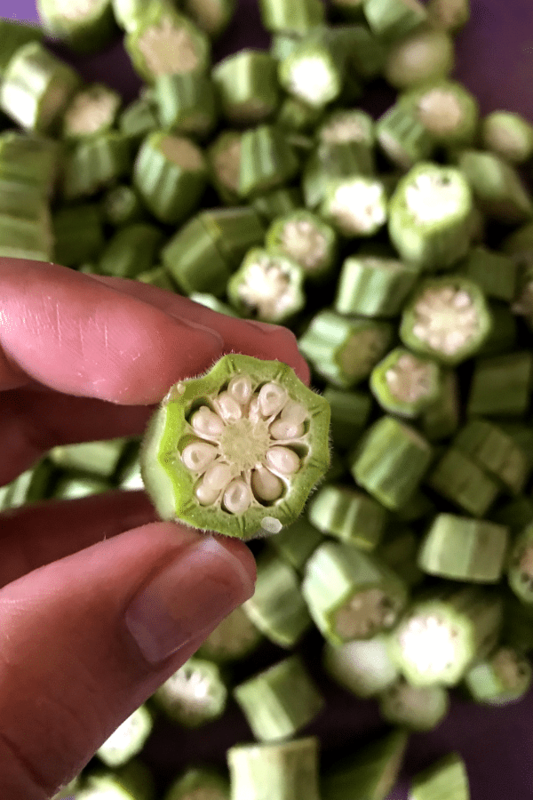 Some recipes call for chopped Okra while some need long cuts. Cook them on high flame for the first 2-3 minutes and then reduce flame to low medium and be sure not to place a lid on top. Also, remember not to toss them constantly while it cooks. Tossing tends to make them mushy. 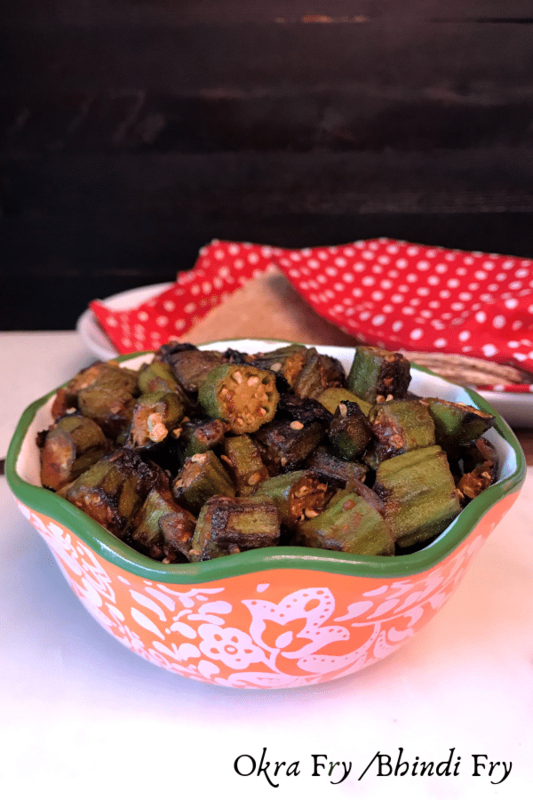 How to serve okra fry – Bhindi fry? 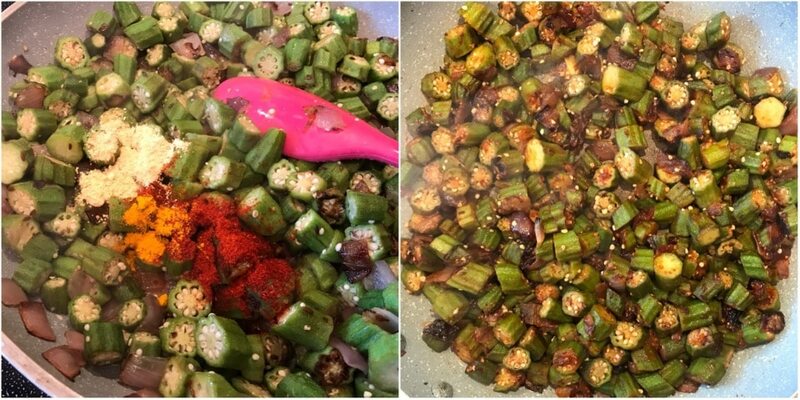 I think I covered most part of the questions related to okra fry recipe. If you any more questions please ask in the comment. For more delicious vegan recipes such as this sent directly to your inbox, just subscribe to my newsletter. You will also get a copy of my e-book where I have put together some simple vegan dessert recipes and dessert essentials. 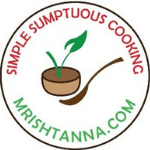 My readers have found it very helpful and I am hoping you will too! 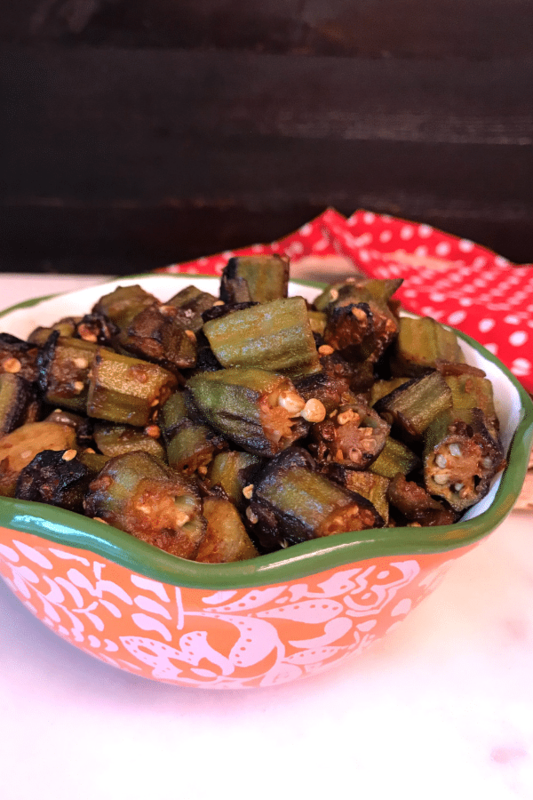 Okra Fry is downright delicious, sumptuous and healthy stir fry with few simple ingredients. 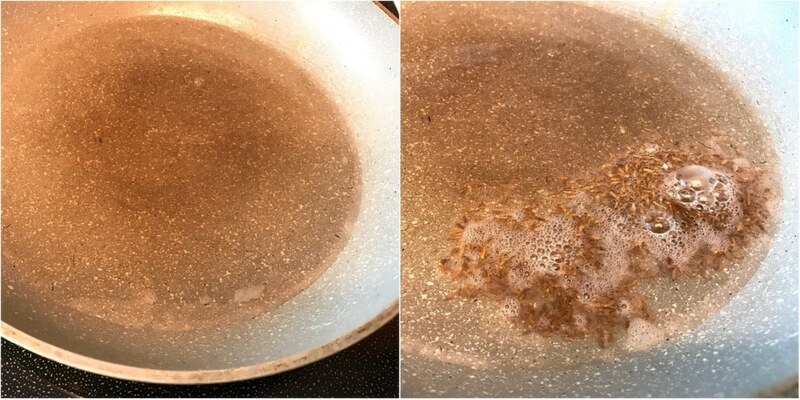 Place a pan over medium heat and add oil. When the cumin seeds sizzle, chopped onions and saute until they turn translucent. Now, add chopped okra and cook on high heat for 2 min. Add all the spices and mix gently. When they turn crispy, add salt to taste and mix well. Okra Fry is ready! Serve them hot with steamed rice or roti! Place a pan over medium heat and add oil. As the oil heats up, add cumin seeds. When the cumin seeds sizzle, chopped onions and saute until they turn translucent.